Do you need commercial wallpaper installed in your office? If you have or are working in an office or commercial building you have seen commercial wallpaper. Like mine, I am sure your Doctors or Dentist office has commercial wallpaper on the walls. The last time you stayed at a hotel you saw commercial wallpaper in the hallways of the hotel. So whether you like it or not, you have seen it, and if you need it for your office then you have come to the right spot! 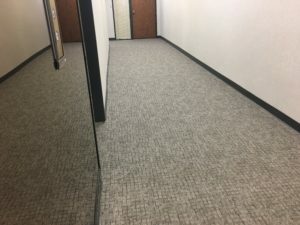 Office hallways with commercial wallpaper. 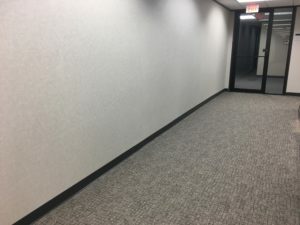 How much does it cost to install commercial wallpaper? The cost of installing any wallpaper depends on several factors. what kind of wallpaper do you want? where do you want the wallpaper installed? Once you know the answer to those questions, now you have to figure out how much you want to spend. There are several types of commercial wallpapers you can buy. Some are more heavy duty compared to others. There are different widths also. Within each type of wallpaper there are different price ranges. It is a heavy decision to make alone. 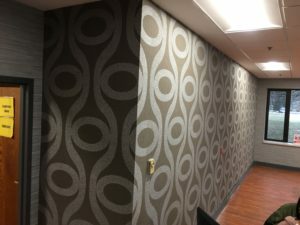 Aside from commercial interior designers, there are a few other sources you can use to find the commercial wallpaper for your home, office or other wall space. Here is commercial wallpaper in a waiting room. What are the benefits of Commercial Wallpaper? Why did I start this paragraph with time and money? The time is how long commercial wallpaper will last compared to Painting. Money is how long the wallpaper will last compared to paint. On average in heavy use areas, you will have to paint every 3-5 years. On average- the commercial wallpaper we are removing was installed 25 to 30 years ago! As an example, the last corridor we just removed wallpaper from was last installed in 1986. As we removed it this year (2018) that means it was on the walls for 32 years! The cost of the paper and installation was estimated at $15,400.00. If you had to paint that same space every 5 years to keep it clean/maintained it would have cost $25,300.00. I think most people, business owners, property managers would enjoy saving almost $10,000.00 in maintenance. Where can Commercial Wallpaper be used? As we said earlier, you have seen it somewhere you have visited this week. Can you be specific? Yes, we can! Just give us the word- and we will help you find where you can use it and how it can benefit you. We have shared the locations you can use commercial wallpaper. We have told you some great resources about where to buy them. You have read the benefits compared to using paint. Do you still have questions? Then give us a call at 833- We- Paper 833-937-2737, and let’s see how we can help you love the space your in! We would love to hear how we can help you love your home or office. Designed and Developed by Slapshot Studio. Fill out the form to request your free estimate.